The Epson Expression Photo XP-860 is a printer from Epson small-in-one range. The printer is best suited for small office and home users. Along, with the basic all-in-one features like, print, scan, and copy the printer also offers fax function. As the name suggests the printer is capable of professional quality photo prints with the help of its high-quality Epson Expression Photo XP-860 ink cartridges. The device has a very small footprint and can fit into any congested small office or home space. It also has a duplexer that helps you reduce the paper waste by 50%. 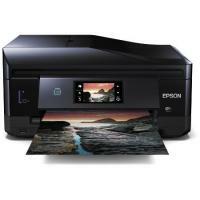 The Epson printer also has Wi-Fi Direct for easy mobile printing. The paper capacity of the device is up to 120 sheets (100 text documents and 20 photo blanks) and it can also print on CD/DVDs. The printer also has an ADF at the top of the flatbed scanner. For connectivity, Ethernet and USB ports are featured in this inkjet printer. The printer also boasts a media card slot, PictBridge interface and Wi-Fi. The Epson XP-860 is four-in-one printer, especially designed for small office users. The device efficiently offers advanced features like wi-fi connectivity, direct printing, CD/DVD printing, memory card reader etc. The printer has individual slots for Epson Expression Photo XP-860 ink cartridges, which helps you reduce your printing budget. Q. What type of print quality issues can occur with Epson XP-860 printer and how we can resolve them? The print quality may get affected when the printer is not been used since a long time. The reason behind this may be clogged printheads or dried out Epson XP-860 ink cartridges. Try the following troubleshooting steps to get rid of such printing issues. Q. Is borderless printing supported by Epson XP-860? Q. What sizes of media can Epson XP-860 print on? A. This printer can print on sizes such as 3.5 in x 5 in, 4 in x 6 in, 5 in x 7 in, 8 in x 10 in, A4 (8.25 in x 11.7 in), A6 (4.13 in x 5.83 in), Executive (7.25 in x 10.5 in), Legal (8.5 in x 14 in), Letter A Size (8.5 in x 11 in). Q. What are the physical dimensions of Epson XP-860 printer? A. The dimensions of Epson XP-860 are:- 390 mm (Width) x 339 (Depth) x 191 mm (Height). It weighs around 8.3 kg. Q. Does Epson XP-860 support any Mobile and Cloud printing services? A. Yes, Epson XP-860 supports Mobile and Cloud printing services like Epson Connect (iPrint, Email Print, Remote Print Driver, Scan-to-Cloud), Apple AirPrint and Google Cloud Print. Q. My Yellow ink cartridge has run out of ink. Do you offer any individual packs for Epson XP-860 ink cartridges? A. Yes, we have compatible individual packs of Epson XP-860 ink cartridges available for our customers to purchase. Q. Is there any risk in using compatible Epson XP-860 ink cartridges instead of original ones? A. There is no risk involved in using compatible Epson XP-860 ink cartridges. We guarantee that you will be satisfied and won’t be making any compromise on the print quality. These are FSC tested products and produce the same quality of output as original cartridges. The only difference between our compatible and original cartridges is that our compatible cartridges are cheaper in price. Furthermore, all our ink cartridges come with a money-back guarantee, thus ensuring the quality of our products. Q. How much ink is supplied in each of the Epson XP-860 ink cartridges? A. The ink volume of the black cartridges T2431 is 24.1 ml and the ink volume of the colour cartridges (T2432 Cyan, T2433 Magenta, T2434 Yellow, T2435 Light Cyan, T2436 Light Magenta is 13.8 ml. Q. When I tried printing a document, found that the paper got stuck inside the product. What should I do to resolve it? Q. Do you offer XL range of compatible Epson XP-860 ink cartridges for the printer? A. Yes, we have the 24XL T2431/2/3/4/5/6 Ink cartridge pack available in the multipack range. Q. Do you sell Epson XP-860 printer? A. We do not sell this printer, but there are many online sites selling this printer at reasonable prices. Q. What safety instructions I should follow while dealing with the cartridges for the first time? Q. My printer sounds like it is printing but when the paper comes out, nothing gets the print on it. Does it means that the ink cartridges used for printing are over? A. No, when you face such problem it does not always indicate of low ink cartridges as when the cartridges are over, the printer will display an error message of low Epson XP-860 ink cartridges. The above problem might occur due to clogged printhead nozzles. This may happen if the printer is not been used for a long time. The ink in the cartridges clogs the nozzles. You must first print a nozzle check pattern to determine if the nozzles are clogged. Then perform the head cleaning cycle if needed. You should take test prints after every cycle to check if the problem has been corrected. Clogged print head nozzles usually require 3 to 4 cleaning cycles to clear the blockage. By now the nozzle check pattern will also appear to be correct. If by any chance the check pattern does not come out correct, then you should replace the old Epson cartridges with new ones. Q. How many cartridges does EPSON XP-860 use? What is the estimated quantity of ink in the cartridge? A. EPSON XP-860 uses 6 high capacity premium compatible Epson XP-860 ink cartridges of the colours T2431 black, T2432 cyan, T2433 magenta, T2434 yellow, T2435 light cyan and T2436 light magentA. One can easily print about 500 pages through the black cartridge and about 740 pages through the colour one. The quantity of ink supplied with the cartridges depend upon whether the cartridges used are the original ones or the compatible version of it. The range of compatible Epson XP-860 ink cartridges we supply contains more ink than the original ones. Q. I have to replace my old ink cartridges but don’t know how to remove them and install the new ones. What steps should I follow to replace the cartridges? A. Make sure that you have your replacement Epson XP-860 ink cartridges handy before you begin. You must install new cartridges immediately after removing the old ones. Caution: Leave the old cartridges in the printer until you are ready to replace them to prevent the print head nozzles from drying out. Do not open ink cartridge package until you are ready to install the new one. Cartridges are vacuum packed to maintain reliability. Recap the used Epson XP-860 ink cartridges using the cap that came with it.